Configuring a static GRE tunnel, before adding the IPsec encryption, takes just a few commands. Have you mastered those commands yet? If not, check out the lab exercise first, and then come back here for the answer and some comments. Should take you about 5-10 minutes if you’ve already studied about GRE tunnels for your CCNA R&S exam. Generic Routing Encapsulation (GRE) tunnels provide a basic building block used to create many services. In its most basic form, a statically-configured GRE tunnel lets an engineer connect two remote sites to each other, while using some other IP network between the sites. Not only that, the GRE Tunnel hides the addressing and subnets of the enterprise from the IP network used between the sites. Additionally, the GRE tunnel traffic can be encrypted, keeping the enterprise’s packets private as they pass over that other IP network that sits between the two sites. This lab asked you to create a manual site-to-site GRE tunnel. The lab creates a fake Internet between the two sites, using a simple Ethernet connection. That simple connection uses IP network 192.0.2.0, while the enterprise uses private IP networks that begin with 192.168. The lab suggested to create the tunnel between routers Edge1 and Edge2, and to configure the tunnel to refer to the source interfaces. 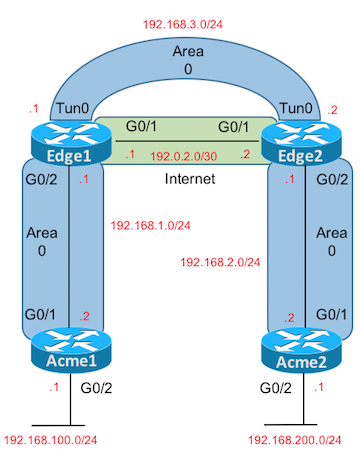 A GRE tunnel’s source and destination IP addresses need to be from the IP network between the two routers, so in this case, both Edge1 and Edge2 needed to use their G0/1 interfaces as the tunnel source; both use the tunnel source gigabitethernet0/1 command. So far, the configuration mentioned in this commentary section is enough to create a tunnel, but it does not yet support the forwarding of IPv4 packets. To do that, each tunnel interface needs an IPv4 address configured. The figure shows that the tunnel interface on Edge1 should be configured with the 192.168.3.1, with mask 255.255.255.0; to configure this use the ip address 192.168.3.1 255.255.255.0 command. Router Edge2’s tunnel interface similarly needs an use the ip address 192.168.3.2 255.255.255.0 command. Note that the two IP addresses are in the same subnet, because the tunnel creates a point-to-point topology between routers Edge1 and Edge2. 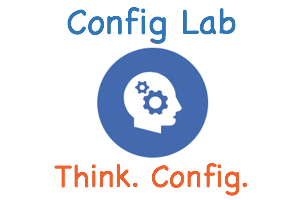 Finally, the lab asked you to enable OSPF so that it works with the pre-configured OSPF process, and to enable OSPF with interface subcommands. That OSPF process uses process ID 10. Both routers use a command with the same syntax on their tunnel interfaces: the ip ospf 10 area 0 command. I’m good with your answer. It does stray a bit from the lab requirements, but for getting a GRE tunnel working, it looks good, other than possibly needing to add something so each router learns a route to the other router’s new loopback IP addresses. EG, a static route to 2.2.2.2 on Edge1 and vice versa. Hi, the command “tunnel mode gre ip” is not needed to create the tunnel? That’s a default setting, so it’s not required. No harm in adding it though. Thank you very much for your labs. Very useful. Much appreciated. Is that correct to leave the static routes on the Edge routers enabled? Maybe to disable them with “no” command to avoid potential looping and mess in configuration. What do you think? I see your point. In this specific (limited) case, I agree, removing the default routes makes sense. In the broader application in real networks, I’d see Edge1 and Edge2 as routers at different sites with the internet between them. The default route would exist so that the tunnels would be able to know how to forward packets across the Internet. In this case, with the Internet represented with a single link, so that you have a default route to reach the other side, you don’t need the defaults. Change this topo to put just one more router in the middle (that is, a slightly larger Internet), so that you would need more than the connected route, then I’d leave the default routes (which you’d likely use for forwarding Internet traffic anyway. Yep, you’ll bump into a variety of “doesn’t work here” type thing with PT. Great tool, just not perfect for 100% of the commands. Thanks for the heads up.